We are coming into the holiday stretch. Weekends are getting booked up by holiday parties and gift buying is just getting started. I’m plugging away (at least trying) at all the holiday gift guides. 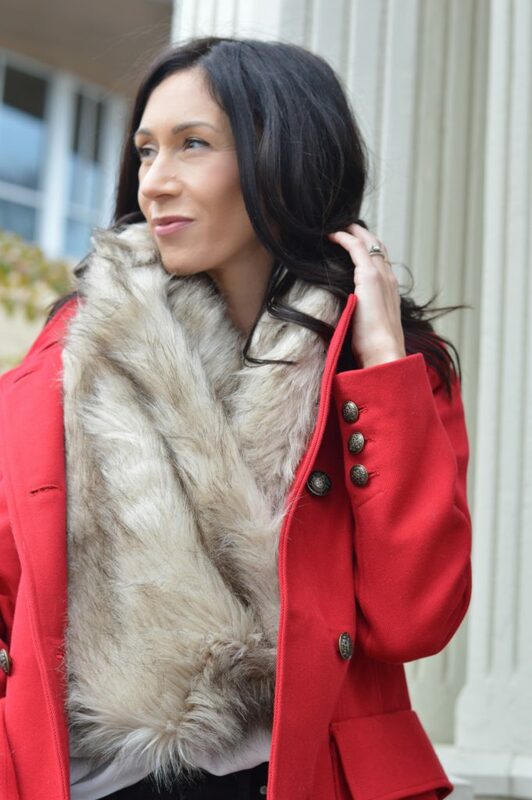 I wanted to share the absolute perfect HOLIDAY red winter coat before it’s sold out! The holidays are hands down my favorite time of year. Thanksgiving hasn’t even come, but my mind is Christmas, Christmas, Christmas. Living in New England, I will most likely be wearing a jacket from now until April. When I came across this one, well, I knew I had to share this red winter coat with my LLP girls. Don’t get me wrong, I will spend any amount of money on a nice jacket, but, this one is a STEAL!! This gorgeous red winter coat from Forever21 is from their premium label; I don’t recall ever purchasing anything from this line before. The quality is unbelievable for the price. It comes with extra buttons (so important), it is lined, and so figure flattering. I am 5’3 and ordered a small. I was worried about the length, but it ended up being perfect. Its the perfect understated glam look for the upcoming holidays. Everything I am wearing is in stock, shop my look below! Hope you enjoyed this post! This red winter coat look is great for Thanksgiving also. Have an awesome weekend. Now, what are you favorite winter coats? Let me know in the comments below!